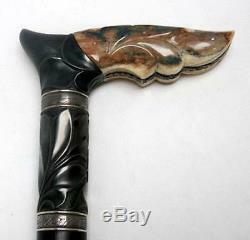 THIS IS A RARE ONE OF A KIND SIGNED LARRY FUEGEN WALKING STICK. FILE WORKED NICKEL SILVER LINERS. CARVED RUST BLUED STEEL FITTINGS. 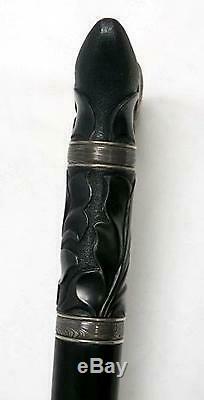 GENUINE EBONY SHAFT WITH DAMASCUS SPACERS. FURRULE AT THE BOTTOM IS SIGNED AND DATED - 2006. INCLUDED IS THE CUSTOM MADE QUILTED VELVET COVER FOR STORAGE OF THE CANE, AS WELL AS THE CUSTOM MADE WOOD DISPLAY HANGER. OVERALL LENGTH IS 36 INCHES APPROX. THE CANE IS IN MINT CONDITION. 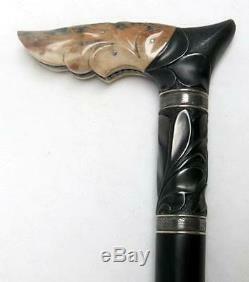 THE CANE IS A ONCE IS A LIFETME OPPORTUNITY TO OWN A RARE PIECE OF USABLE ART. PERFECT GIFT FOR THAT SPECIAL SOMEONE IN YOUR LIFE --- OR YOURSELF. The item "HAND FORGED HAND CARVED SIGNED LARRY FUEGEN WALKING STICK" is in sale since Thursday, March 8, 2018. This item is in the category "Clothing, Shoes & Accessories\Unisex Clothing, Shoes & Accs\Unisex Accessories\Canes & Walking Sticks". 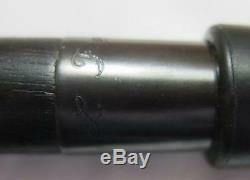 The seller is "poukey0" and is located in Pearblossom, California. This item can be shipped worldwide.